Kuala Sepetang is a coastal town located in Perak, Malaysia. Just about 60 minutes or 18km to the west of Taiping city to Kuala Sepetang. It is a thriving fishing village, and the main jumping-off point to the river mouth community of Kuala Sangga, which is a Chinese fishing community at the river mouth which specializes in fish breeding in cages. The Port Weld railway station was located at the centre of town. The whole railway line from here to Taiping, which was the first railway line in the Peninsular, is now dismantled, and now only the ticketing booth and the Port Weld railway signboard remain. The Mangrove Forest Reserve is known as the best managed sustainable mangrove ecosystem in the world. This mangrove reserve contains rich and diverse wildlife that provide nature lovers to visit and explore its wetlands and resources. You can stroll along the wooden boardwalk and observe forestry and fishing activities and denizens that thrive in the muddy mangrove floor. Visit the mangrove forest and charcoal kiln sites which are found more inland. Bird watching and fishing are the primary activities in the morning while at night get a boat ride to see synchronized blinking lights of fireflies. Although the Mangrove Reserve often "mangrove Matang Forest Reserve" is mentioned, you should not drive to the village of Matang. This is a small village about 5 kilometers away from the reserve and that you have passed away. Ride along to Kuala Sepetang. 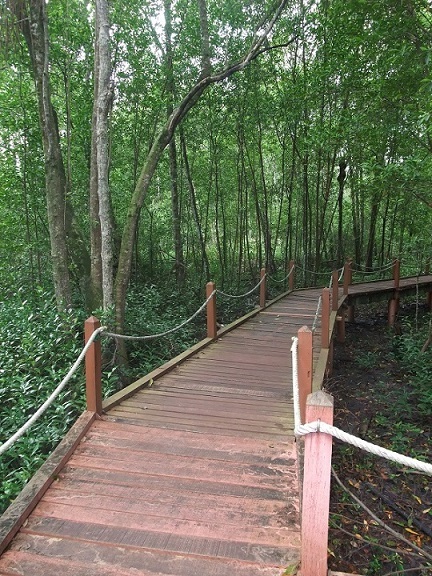 Just before you enter the small fishing village is the Mangrove Forest Reserve. The vibrant Kuala Sepetang village is only about 200 meters from the reserve. You must follow a path from Taiping (a straight road) to the mangrove forests. 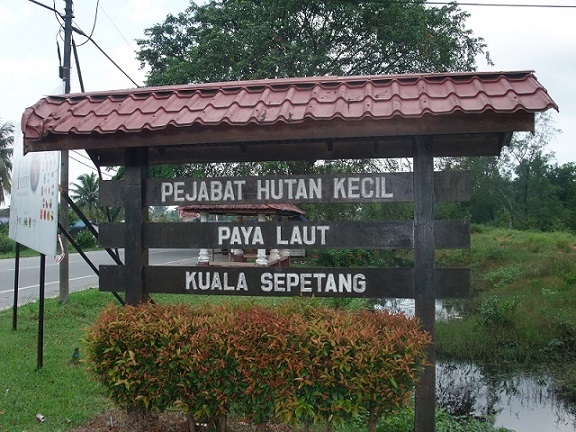 Even in Kuala Sepetang is difficult indicated where the reserve begins. Just before the village you'll see a board (see picture right). This sign tells in Malay "Little Forest Office, Mangrove, Kuala Sepetang" (translated). You will come to a small office with a barrier and you can drive to a parking lot beyond. If it is unclear, you can ask anything at the office. You do not have to pay. The entrance is free. After two turns, you will see some buildings, which are under construction. There is plenty of parking lots and a toilet. 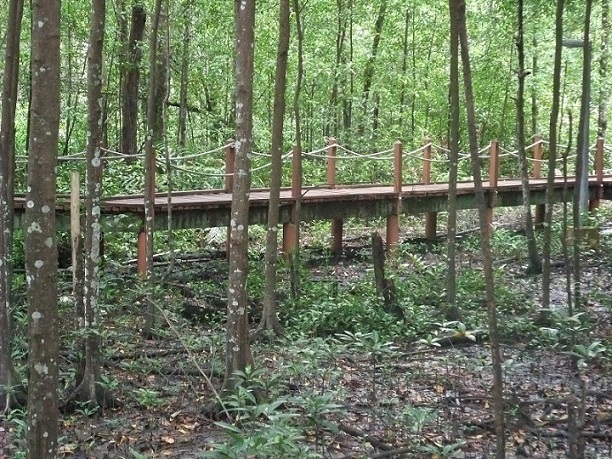 At this parking place starts the boardwalk that leads you through the mangrove forest. 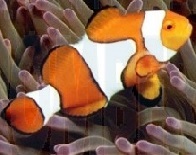 Everything is still in development, you'll see no tourists. There are some houses along the path, which are not in use, but it can be. Probably they will be hired by nature lovers in the future. Like all mangrove swamps, the Matang Mangrove Forest Reserve has been proven to act as a natural barrier against tsunamis. Undoubtedly, it is an important site for coastal migratory water birds and a portion of migrant forest birds. As many as 43,000 to 85,000 birds may be seen using the forest during the migration. According to some ornithologists, there is a small population of rare and shy Great Argus Pheasant (Argusianus argus), known locally by the Malays as Kuang, that stays close to the ground and makes short flights to low hanging branches of the mangrove trees. These large birds make a characteristic sound in the mangrove forests with two main calls � a repeated slow double note ku-wow ku-wow and a series of single hoots kwow kwow kwow kwow accelerating and rising in pitch. The Mangrove Forest Reserve is also regarded as the breeding grounds for numerous species of marine crustaceans including crabs, shrimps, lobsters, horseshoe crabs and prawns as well as fishes and shellfishes. Nestled in Taiping, this eco-friendly property rests amidst a breathtaking lake and garden. Featuring a refreshing ambiance from its beautiful surrounding, Flemington Hotel is tailored to cater to both business and leisure travelers. Boasting modern and elegantly designed rooms, Flemington Hotel is fitted with up-to-date furnishings and boasts all standard amenities needed for utmost comfort. Since there are a variety of room styles available, Flemington Hotel is also perfect for singles, couples, or even group stays. For leisure, guests have a variety of dining options and a bar on-site. 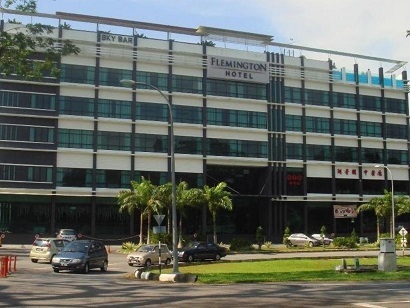 Flemington Hotel is a well appointed and modern property suitable for all.